Have you spent far too much time and money looking for a dry skin treatment that does not work? Your search is over, we guarantee you will be impressed, or we will give you a full refund! 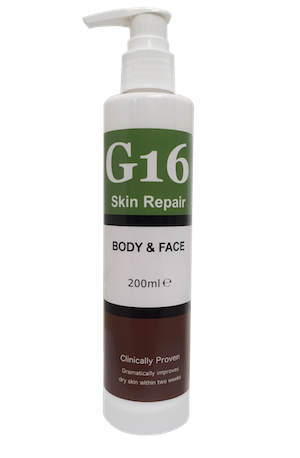 G16 Skin Repair Lotion has been developed over the last 10 years and has helped thousands of people restore confidence in their skin. G16 Skin Repair Lotion is our newest development and we know that you will love it. G16 is the next generation of its predecessor, the extremely popular G15. G16 Skin Repair soaks in to your skin within 3 minutes of applying and does not leave any clammyness on the skin whatsoever. Unlike G15, G16 boasts results within only 7 days instead of 14 days. Don't just mask the dry skin like other treatments, remove it completely with G16! Formally SR Lotion, G16 Skin Repair Lotion is the best treatment available for these related forms of dry skin and it’s time to get that confidence back as we have spent years perfecting G16 Skin Repair which is now helping thousands of people around the world. In fact in a lot of cases it has been seen to completely restore the skin to its normal form within just 2 weeks (see before and after pictures above). It has outstanding results on several types of dry skin from severe Xerosis to mild dry skin patches due to our unique manufacturing process. We know that you have probably spent lots of money trying lotions, creams and other products that claim to work, but we assure you that you will be extremely happy with G16 Skin Repair Lotion for dry skin and that you will have the best looking skin you have ever had, which is why we offer a full money back guarantee.